A memorial for Mihirtej Boddupalli and Sajaad Safiullah Syed has been set up outside Quarry Lake where the fatal crash occurred. Boddupalli and Syed were high school classmates at Naperville North High School and were both members of the cross country team. Mihirtej Boddupalli was never one to miss an opportunity to do good. The stakes were set: $1. News of the competition quickly spread around the campus. Soon, much of the student body planned to attend. Once Boddupalli discovered a large turnout was expected, he capitalized on the popularity of the event. Boddupalli found a way to make a spontaneous contest — which stemmed from what his brother called either overconfidence or boredom — into a meaningful fundraiser. This event exemplified Mihir Boddupalli’s true nature, his brother Dhruv Boddupalli wrote in an email to The Daily. “This is just one story among many with which we remember Mihir for who he was — an individual who wielded a combination of charm, wit, and irreverence to, surprisingly, care deeply about others,” Dhruv Boddupalli wrote. Rising senior Mihir Boddupalli, 21, was an industrial engineering major in the McCormick School of Engineering and Applied Science. He drowned Saturday morning when a car he was traveling in crashed into a water-filled quarry in Naperville, Illinois. At NU, Boddupalli was a member of Pi Kappa Alpha Fraternity and a manager at Campus Solutions. Pike president Calvin Dorsey said the entire fraternity is grieving from the loss of Boddupalli. Boddupalli also served in the summer of 2012 as a fellow at the Medill Justice Project, an investigative journalism program that examines potentially wrongful convictions. Medill Prof. Alec Klein, director of the Medill Justice Project, said Boddupalli was both talented and smart. “It’s hard for me to talk about it because it’s so tragic and it was like one of those things when I heard his name it was just so painful to hear it,” Klein said. Klein said he first hired Boddupalli because of his engineering background. The team wanted to “cross-pollinate” respective talents to create a national shaken-baby syndrome database. The public database contains more than 3,000 shaken-baby syndrome cases from across the country. Dean of Students Todd Adams sent an schoolwide email Monday extending condolences on behalf of the University to Boddupalli’s friends and family. A memorial was set up near the quarry where the fatal crash took place. 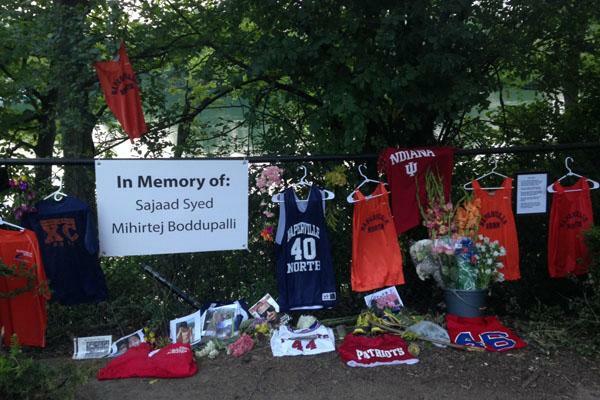 The site along the water was adorned with flowers, commemorative items and photos in memory of Boddupalli and Sajaad Safiullah Syed, a 21-year-old Naperville resident and rising senior at Indiana University, who also died in the crash. Michael Szot, a rising McCormick senior, was driving the car at the time of the crash with a BAC above the legal limit and has been charged in connection with their deaths, police said. In Boddupalli’s memory, his family started a fundraising campaign for St. Baldrick’s Foundation. Every year in high school, Boddupalli shaved his head to raise moneyfor the foundation, which supports childhood cancer research. Boddupalli’s friends remembered him in different ways. Many NU students shared personal memories and anecdotes through Facebook statuses and photos that highlighted Boddupalli’s character. Adam Bevel, a DePaul University student who attended high school with Boddupalli, recounted memories of his friend in a post on his blog. He wrote that Boddupalli influenced the person he is today through his constant wit, humor and concern for his friends and everyone around him. When Bevel was struggling after his girlfriend broke up with him, he said Boddupalli stopped him from becoming depressed. Bevel thought he would have to attend the upcoming high school dance alone, but Boddupalli asked Bevel to be his date. Bevel said the night, complete with photos, dinner and dancing, was his best high school dance experience. Bevel wrote that although Boddupalli’s softer, more tender side was rarely seen by those around him, Bevel had the privilege of experiencing it firsthand.